Keratosis Pilaris is chicken bump skin. If you know what chicken bump skin is, you probably have it or know someone who does. If so, you know how hard it is to treat, because nothing seems to work. And it is unsightly, especially in the warm weather when you want to wear arm-revealing apparel. Learn about an easy, safe remedy for KP: Lordsbury Retinol+C Cream Moisturizer. Keratosis Pilaris is small, dry white bumps that occur in patches. They are an excess build-up of keratin in numerous adjacent hair follicles within an area. They are most common on the back of the upper arms, the back and can appear even on buttocks. And they don’t exfoliate away, they don’t respond to acne medicine or creams, they seemingly respond to nothing, and they can get itchy. Oh, and they get angry looking in the heat, in the cold, from creams, sprays, clothing, and it would seem for no apparent reason at all. It is sort of a not problem of a problem until it is one. Keratosis Pilaris can’t really hurt you unless you get an infection from scratching it. You also can temporarily tame the KP beast with a gentle exfoliation with mild soap and perhaps a brush device like Clarisonic, but you can also make a mess of your skin trying to treat it if you use the wrong products. And it is easy to mistake for acne or poison ivy if you don’t know better, starting a vicious cycle of KP inflammation and redness. The dread Chicken bump skin will respond to prescription strength Retinol. Retinol gently exfoliates off the dead skin cells entrapping the hardened keratin and replaces that skin with chicken bump-free skin, for the time being at least. It takes a good four to six weeks, but it clears it up pretty well. Further, with regular long-term use, the retinol helps prevent the hardened keratin bumps from forming in the first place, which reduces KP bump formation. The caveat is that it that Retinol can also make skin dry, flaky and itchy, which make it more difficult to not scratch, which in turn, makes KP all the worse. So the Retinol needs to be buffered. And therein lies the rub: so many other ingredients can irritate KP that not all creams or lotions can be used as a retinol buffering agent. 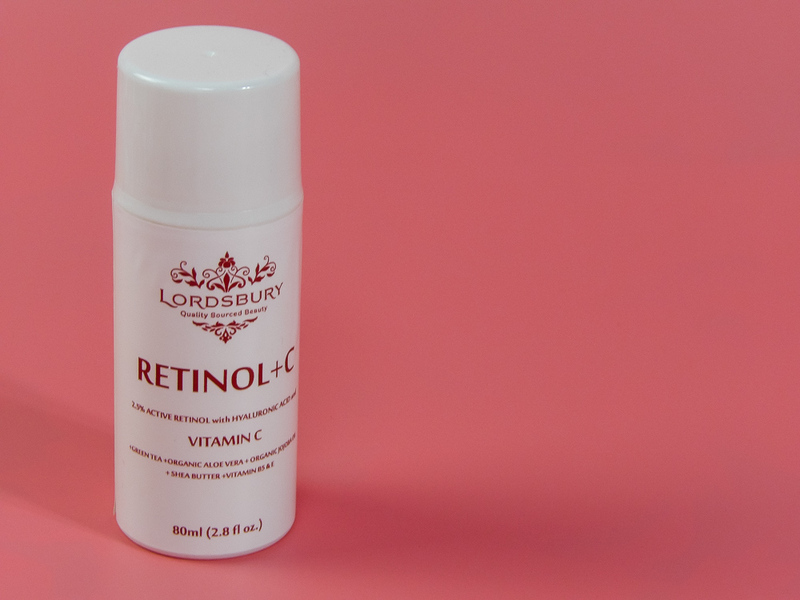 One product we found that is excellent for treating KP is Lordsbury Retinol+C Cream Moisturizer. It combines a prescription strength Retinol of 2.5% with 20% Vitamin C serum. Together they sack chicken bumps, clearing out existing bumps and eliminating the excess keratin from the skin. This prevents new bumps from forming. There is also the bonus of several natural Keratosis Pilaris friendly moisturizers to buffer the active ingredients. These include the super soothing Jojoba Oil, Aloe Vera, and Sunflower Oil. This not only makes Retinol tolerable but eases the itchiness of existing chicken bumps, which makes it much easier not to scratch. If you are in the market for KP products, you will notice they pretty much all have one thing in common: a steep price tag for a not so big bottle. Lordsbury Retinol+C Cream Moisturizer comes in a large and generous 2.8-ounce size for under $30, which makes it the most cost-effective treatment I’ve found to date for the Keratosis Pilaris on my upper arms. My chicken bump situation is pretty mild, but I’m self-conscious about the area during the summer, and I’m happy to report the Lordsbury Retinol+C moisturizer took care of the problem without any irritation to the area. So this summer, I am chicken bump free! Looking to try a Retinol with all the prescription strength benefits and none of the irritation? 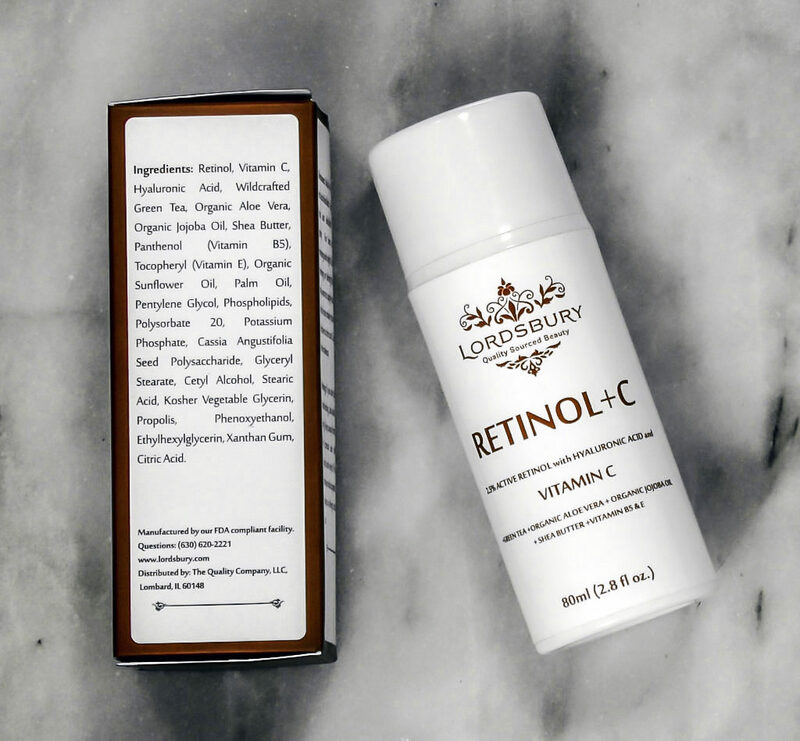 Try Lordsbury Retinol+C moisturizer, a twice a day 2.5% retinol with 20% Vitamin C and loads of natural moisturizers to keep skin soft and dewy. Here at Style Chicks, we love the concept of Beauty Wellness: the things you do for your wellbeing that have an added beauty benefit, whether it is better posture, better sleep, or simply doing something that puts a glowing smile on your face. There is also no denying that we are huge skincare enthusiasts here, and we know you are too. The folks at Eucerin have combined Skincare and Beauty Wellness into a fantastic video series called “Prepare to Repair! The Eucerin “Prepare to Repair” video series has simple, effective tips from board-certified dermatologist Dr. Debra Jaliman to help repair skin’s moisture and from Fitness Instructor Kirsten Trued to help repair muscles. These tips will help optimize your total wellness efforts! In this series, Kirsten teaches a series of exercises that use a small ball for gentle firm pressure, emulating a known therapeutic sports massage technique. Our hands endure plenty of wear and tear during the day, ranging from using computer technology gear to washing dishes. The repetitive motion can be grueling to the tendons and muscles of the hand, which makes regular, gentle stretches so beneficial. Fitness Instructor Kirsten Trued recommends two effective stretches to ease achiness and repair both hands and forearms, while moisturizing skin. 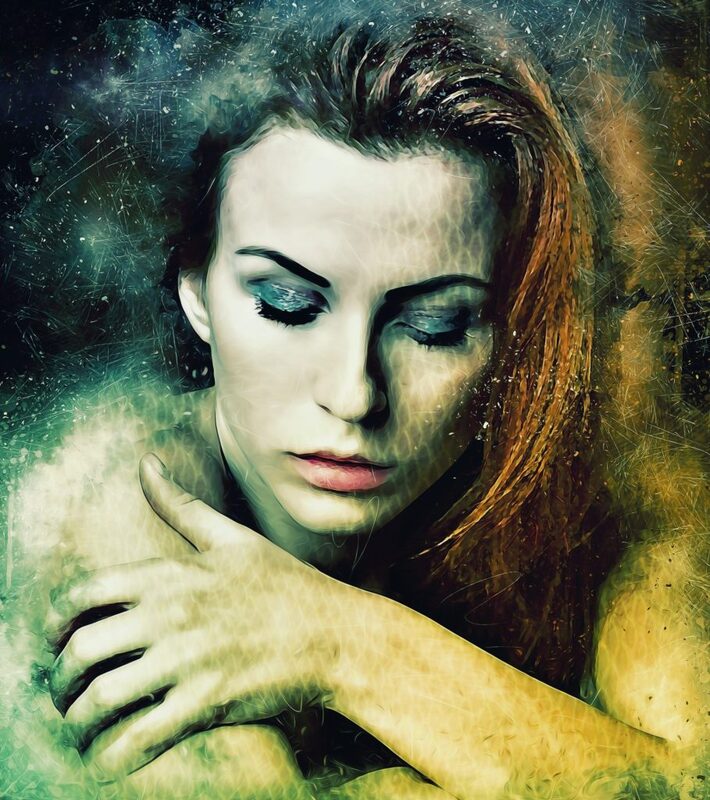 Winter wreaks skin havoc, causing dryness and redness, including Eczema flare-ups. To help pre-empt a flare-up, Eucerin Eczema Relief Body Creme contains colloidal oatmeal that soothes while Ceramide-3 acts a barrier to lock in moisture. I especially like to use this in dry environments such as those with indoor forced air heat, like my office building. Sweating during a workout can provoke eczema breakouts, which means regular workouts can begin a vicious cycle. Eucerin Eczema Relief Flare-Up Treatment Creme is intended for use during an active flare-up. It contains Licochalcone A, a licorice extract which is clinically proven to significantly improve the skin’s appearance during flare-up phases. The rich-feeling creme is fragrance-, steroid- and dye-free. Keeping the muscles in your back, chest, and neck strong and toned is vital for proper posture. Good posture makes you look slimmer and taller, and feel younger and healthier. Have you noticed how people round their shoulders and extendedly bend their necks forward while using their phone, tablets, and laptops? These simple exercises not only will help undo some of the stress we put our neck each day but impart a smoother, more elegant neckline and collarbone. I’ve been remiss over the years about upper body skin care. While I carefully slather my face and throat with skincare topicals and sunscreen, I’ve been haphazard with my shoulders, decolletage, and upper arms. But these areas all belie age with sun damage, dryness, lack of firmness and wrinkles. What can be done to compensate for upper body skin neglect? Two Eucerin products that help reverse time are Eucerin Intensive Repair Lotion and Eucerin Advanced Repair Lotion. Eucerin Intensive Repair Lotion contains one of my go-to favorite ingredients: Alpha Hydroxy Acid, also known as AHA. AHA, a natural acid found in foods, is a superstar of the skincare realm. AHA’s are often used in anti-aging products and treatments due to their ability to gently but effectively remove dead skin layers without the unsightly peeling or redness that manual exfoliation can cause. For those with sensitive skin, AHAs can be drying, but Eucerin Advanced Repair Lotion and Eucerin Intensive Repair Lotion contain several buffering ingredients that keep skin hydrated enough to stay soft and supple while benefiting from AHA. What a great duo these two make to treat, protect and hydrate! As a side note, I find the AHA in Eucerin Intensive Repair Lotion quite helpful with Keratosis Pilaris (KP), better known as those “chicken bumps” that appear on upper arms. For optimal skin health, KP treatment requires both exfoliation and hydration which makes Eucerin Intensive Repair Lotion and Eucerin Advanced Repair perfect for the job. And I like that they are fragrance-free and absorb quickly without leaving residue on skin or clothes, which is highly preferable to any medicated KP treatment. Eucerin Advanced Repair Lotion keeps you hydrated for 48 hours. Are your legs sore at the end of the day? Whether from wearing high heels or chasing toddlers the leg muscles often need attention. These exercises work the entire quad and hamstring inch by inch and add in a stretching component for a deep muscle massage. Doing these exercises daily makes legs far more comfortable, even after a busy day on your feet. And because even skin that is not exposed to the elements can still become very dry, this Eucerin series pairs Eucerin Original Healing Lotion uses simple, safe ingredients to help repair skin. It is paired with the Eucerin Skin Calming Creme for a total beauty wellness leg care plan. The Eucerin Skin Calming Creme is formulated with natural oatmeal to calm skin and keep it moisturized. The Eucerin “Prepare to Repair” video series makes the most of easy to implement, reparative stretching exercise techniques paired with effective skin products targeted to specific skincare needs. The Eucerin Repair line provides dry, itchy, rough skin with long-lasting hydration, using safe, effective ingredients that are non-irritating. Skin instantly looks and feels so much better. Eucerin replaces the dull, dry look of winter skin with a hydrated and smooth glow that quickly dries down to a non-greasy finish. Warmer weather is just around the corner, and it’s time to get skin ready to be seen. You put time and effort into your beach body workouts, don’t forget your skin! Style Chicks wrote this article and received compensation for our time and effort. However, the opinions expressed are 100% ours.